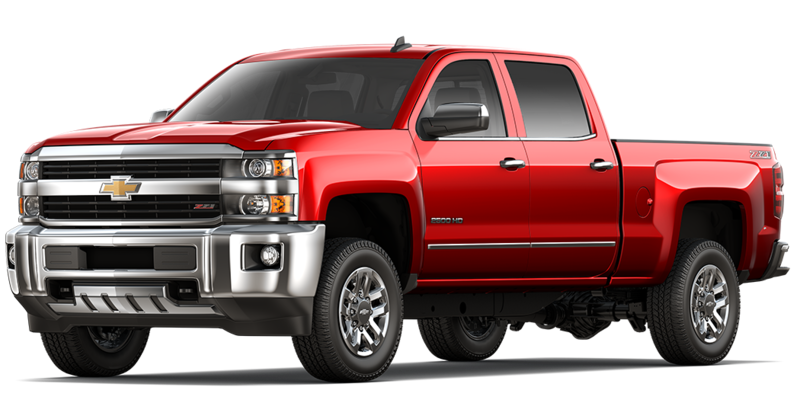 The 2018 Chevy Silverado 2500HD continues this pickup line’s long history of great performance and towing capacity for people needing the ability to haul people and cargo virtually anywhere. The combination of powerful engines, intelligent traction control, and a solid frame offers a lot of capability from the 2500HD. This capability is also the very reason why so many people choose this truck over the competitors. A multiuse platform mixed with great interior and safety features is a no-brainer for Chevy lovers. The 2018 Chevy 2500HD sits right in the middle of the pickup truck lineup. Offering more horsepower, torque, and general capability than the 1500, the 2500HD is the “just right” model of the line for many customers. With power ranging in the 360 hp area, this truck can haul up to 14,500 pounds. That figure alone makes the truck a popular option for people needing a vehicle capable of great trailering and hauling. The 2018 2500HD Silverado starts at $34,160 MSRP. Beyond basic hauling, the 2018 2500HD Silverado comes with many convenience and safety features that almost make it seem like you are buying a family sedan. Chevy uses many of the same features between its car, truck, and SUV lines. As a result, the Silverado comes with many standard and optional upgrades that make the whole driving experience more comfortable and safer at the same time. On the safety side, the 2500HD comes with a standard set of front and side driver/passenger airbags that will deploy in the event of a crash. The extended and full-size cabins also feature side airbags for rear passengers to increase the safety of all occupants in the truck. Additionally, the rear seats include anchor points and tethers to safely secure children seats. Active safety features include several optional systems ranging from a forward-collision detection system to parking lot front and rear sensors to warn the driver of other vehicles. The lane-departure system will also provide an alarm should the truck begin to stray out of a highway lane at high speeds. Unique to Chevy and GM vehicles, the Teen Driver System comes standard on all Silverados and will help aid new drivers that limit the vehicle’s capabilities, increases safety feature settings, and allows parents to monitor and limit things like speed and audio. Beyond safety, the Silverado 2500HD also comes with many convenience features to make the driving experience more comfortable. First and foremost, the interior space provides ample leg and headroom. It also includes optional leather accents and seats with heating elements in the front. Optional power-adjustable pedals and seats also allow the driver to customize the setup to their personal liking. The built-in infotainment system comes with a 7-inch touchscreen using Chevy’s MyLink software to control a number of vehicle settings. Standard Bluetooth, USB, and AUX input connectivity are available through this system. As optional upgrades, the 2500HD is also compatible with Android Auto and Apple CarPlay to enhance the voice control and recognition for hands-free driving. To keep smart devices charged on the go, the interior of the Silverado 2500HD is dotted with four 12V outlets and four USB charging ports. The ports draw power straight from the main battery to provide a constant supply of energy for long road trips or power-hungry devices you may need during the daily commute. The 2018 Chevy 2500HD retains its signature Chevy look that makes it stand out from the competition. If you could only use one word to describe its chassis, it would be “beefy.” The sheer mass and style of the truck is enough to make its presence known on the road. High ground clearance and a tall cabin provide great visibility from the driver’s seat as well. The 2018 model includes a slight redesign to the front of the truck. A new grille comes in a two-bar design in chrome or black depending on the trim you buy. The headlights retain their stacked appearance with dual turning blinkers. With more height than a medium sized pickup, the whole front is tall and bulky without obstructing the driver’s view out of the front window. The rest of the truck retains this blocky appearance all the way to the end of the tailgate. Since this is a full-size pickup, you can expect the interior cabin to be roomy regardless of the specific length and layout. The base model comes with the standard two-door setup with options to expand the cabin to a crew or full cab design if multiple passengers need to travel around in comfort. The rear is all about cargo and hauling. The truck bed alone is built to haul up to 4,000 pounds of cargo depending on the size. Various anchor points will allow you to get creative when securing cargo down you don’t want to lose on the highway. Like the cabin, you can also select the appropriate size of the bed to maximize cargo space or the truck’s maneuverability. The combination of the bed and cabin will determine the overall length and handling of the truck. No one has ever accused the 2500HD Silverado of sacrificing power and performance for style points. While the chassis is a looker in its own right, the real magic happens under the hood with several engine and drivetrain options that allow customers to pick the right setup for their needs. Virtually everything about the powertrain of this truck is meant for either high trailering or hauling capacity no matter what the cargo may be. The standard engine of the 2500HD is a Vortec 6.0L V8 that offers a respectable 360 hp and 380 pound-feet of torque. This flex-fuel option is perfect for a truck that will see daily use without too much abnormal heavy lifting. Standard fuel economy is around 11 city and 16 highway MPG. Coupled with a six-speed automatic transmission and two or four-wheel drivetrain, the whole powertrain will be just right for a majority of customers. For people needing that extra boost in power, however, the 2500HD’s diesel option may be a safer bet. The Duramax diesel 6.6L V8 is a monster of torque that has little rivals from other competitors. With a max hauling capacity of around 14,500 pounds, it offers the most performance with even better fuel economy. On the highway, the diesel engine has a max range of around 680 miles with 19 highway MPG, outpacing other competitor trucks in this class. Come down to DePaula Chevrolet! DePaula Chevrolet has an affinity for all Chevy trucks big and small. The reason is simple. The Chevy truck line matches our own commitment to excellent performance and service. When you need something that won’t falter when it truly matters, our dealership is the only place to check out for all of your automotive needs. We spend each day helping countless customers find what they need out of a new car, truck, or SUV. With the backing of the Chevy badge, any vehicle you look at on our lot will meet our high standards in quality. In other words, when you come to us, you will get nothing but the best. Our excellent service goes beyond our inventory as well. Whether you need maintenance, repairs, or just a random spare part, we help you with any need so you can get back on the road in no time.